Hear the name Achilles and most people will think of Brad Pitt, the Trojan War, or someone’s weakness, a.k.a. an “Achilles Heel.” However, not everyone knows how his story fits into Greek Mythology. While it’s counterintuitive to deem anything associated with mythology a fact, this study guide reviews most of the important facts about Achilles in Greek Mythology. Like many figures in Greek Mythology, Achilles story begins before he is even born. Achilles mother was a sea-nymph named Thetis whose beauty tempted the ever-philandering god Zeus. Having been warned by Prometheus that he would be dethroned by a child born to him and Thetis, Zeus forced Thetis to marry a mortal in order to remove the temptation. Thetis and her husband, Peleus, had six children before Achilles. The first six were thrown into fire by their mother in an effort to burn out their mortality. The seventh child was saved from this fate by his father and eventually Thetis accepted the child and grew to love him. She called him Achilles and, wanting to protect him from his human frailty, took him to the River Styx which was believed to convey immortality. Thetis held him by his heel and submerged the infant Achilles. All but the heel she held were suffused with inordinate strength, hence, Achilles heel. 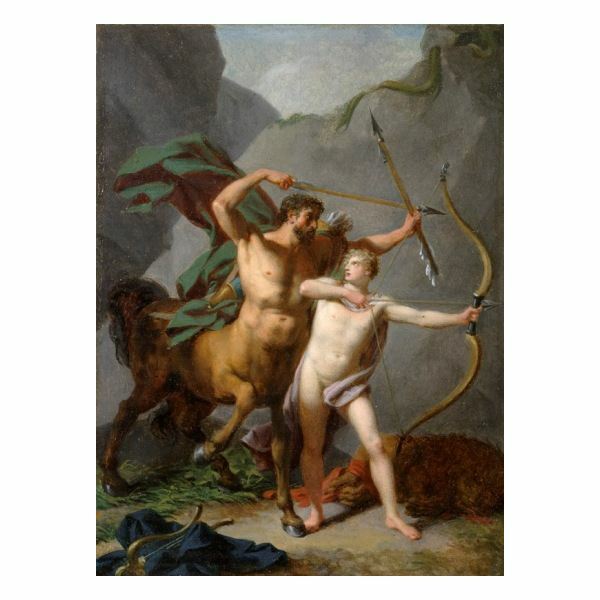 Achilles was educated by Chiron, a centaur who lived on Mt. Pelion and was revered for his wisdom. Achilles grew strong, handsome, and well versed in the strategies of war and peace. When the call came for Greece’s greatest warriors to amass and avenge the taking of Melenaus’s wife, Helen, by the Trojan Prince Paris, a fretful Thetis rushed her son off to the island of Skyros disguised as a girl. While hiding on Skyros, Achilles fathers a son with the king’s daughter Deidameia. Eventually, Achilles whereabouts became unveiled and Odysseus weeded him out with a cunning ploy; he sent gifts of jewelry and trinkets to the women’s lodgings that included armor and a sword. News of young woman practicing with the weapons brought emissaries to insist Achilles join the war. The Iliad by Homer tells only a fraction of the story of the war. The war lasted nine years, while Homer's epic recounts events from only the last year. Achilles's tale begins much earlier when he joins the fleet of Greek warriors setting sail for the Trojan shores as commander of a feared force known as the Myrmidons of Thessaly. For much of the war, Achilles is at odds with Agamemnon, king of Mycenae and supreme commander of all the Greek forces. The heart of the dispute, just like that of the war itself, is a woman. During the course of the long war Briseis, a Trojan woman, was taken as booty and given to Achilles as a concubine and he cherished her for her beauty. Similarly, Agamemnon's mistress Chryseis, the daughter of a priest of Apollo, was taken in one of the cities of the Troad. After refusing a ransom demand from Chryseis's father, Apollo inflicted Agamemnon's troops with a plague. The seer Calchas advised Agamemnon to appease the god by returning the girl; he capitulated but his price was Briseis. An enraged Achilles conceded, as it was the supreme commander's right, but audibly vowed the Myrmidons would no longer fight for Agamemnon. Achilles recruited the aid of his mother who, in turn, went to Zeus. He caused Agamemnon to dream of victory by aggressively moving his army forward. Agamemnon tried this and was met by Hector, the brother of Paris. A fight between Paris and Menelaus was suggested. The two faced each other in the no-man's-land between the forces; Menelaus was winning until Aphrodite, who always favored Paris, surrounded the Trojan in a protective mist and spirited him to Helen waiting in his room. Then, Athene, who wanted to see Troy defeated, inspired a Trojan soldier, Pandarus, to shoot Menelaus in the thigh with an arrow. The truce was broken. The ensuing battle saw a wounded Aeneas, and Aphrodite was injured in her attempt to aid him as was the god Ares when he joined the fight. The battle ended in a stalemate and Agamemnon sent Achilles an offer: if he rejoined the Greeks, Briseis would be returned and Achilles would have his choice of a wife from the king's daughters with a dowry of seven cities. Achilles refused and announced plans to return home. Agamemnon planned for retreat. Odysseus and Diomedes take matters into their own hands; they silently cross the line during the night and force a guard to describe the Trojan camp in detail. With this knowledge, they manage to kill the king of Thrace (a Trojan ally) and steal his fabled white horses. Legend had it, Troy could not be taken as long as these horses drank from the River Scamander. This was an excellent omen for the Greeks. A vengeful Hector retaliated in the morning. Many Greeks fell and one of their ships was seized and burned. Achilles dear friend and cousin, Patroclus, pleads with him to stay and rejoin the fight. He refuses but is persuaded to allow Patroclus to lead the Myrmidons in an effort to push the Trojans back to Troy on one condition; Patroclus must not pursue the enemy to the walls of Troy. Patroclus murders the Lycian commander Sarpedon, another ally of Troy and Zeus' son, in the push and, in his exuberance, forgets his cousin's orders. At the walls of the city Apollo, shrouded in mist, strips Patroclus of his weapons. Hector pounces on his chance and kills the young Trojan, taken the armor Achilles had lent him. Grief stricken, Achilles cuts off his hair and unleashes a fearsome battle cry. With new armor crafted by Hephaistos, he sets out to find and kill Hector. He chases the Trojan prince three times around the walls of Troy until Athene delivers Hector a fresh dose of courage. Hector faces Achilles who works fast and slaughters his foe. He then ties the corpse to his chariot feet first and drags the fallen prince to the Greek camp. For days, he mistreats the body as he mourns the beloved Patroclus with funeral games and a burning pyre. The gods meet on Mount Olympus to end the desecration. Thetis is dispatched to tell Achilles to return Hector to King Priam; the goddess Iris is sent to Priam with instructions to set a ransom. Hermes, the gods’ messenger, escorts the old man to Achilles camp. The warrior takes pity on the old man and promises a twelve day truce for Hector’s funeral. Troy had lost its hero and decade of war had weakened its defenses. Yet the Trojans still had allies, among them the Amazonian female warriors and King Memnon of Ethiopia, and so the fight wore on. In it, Achilles was hit by an arrow shot by Paris and directed by Apollo into his weak heel. The Greek hero Achilles was no more and the fighting halted-briefly. Soon it resumed and with the assistance of Achilles bow, his son, a stolen statue of Athene (the Palladium), and the famous Trojan Horse, Troy fell to the Greeks. The victors unleashed terrible violence on Troy’s citizens and Priam’s family. The king lost yet another son and then his own life. His daughter, the prophetess Cassandra, was raped and another sacrificed to the spirit of Achilles. Helen, meanwhile, was returned to Menelaus and the pair lived out their years together.